Some people don't enjoy hand knit socks in warmer weather, but I think you'll agree, a light, cotton/bamboo based yarn and an airy eyelet pattern go together like a wink and a smile. 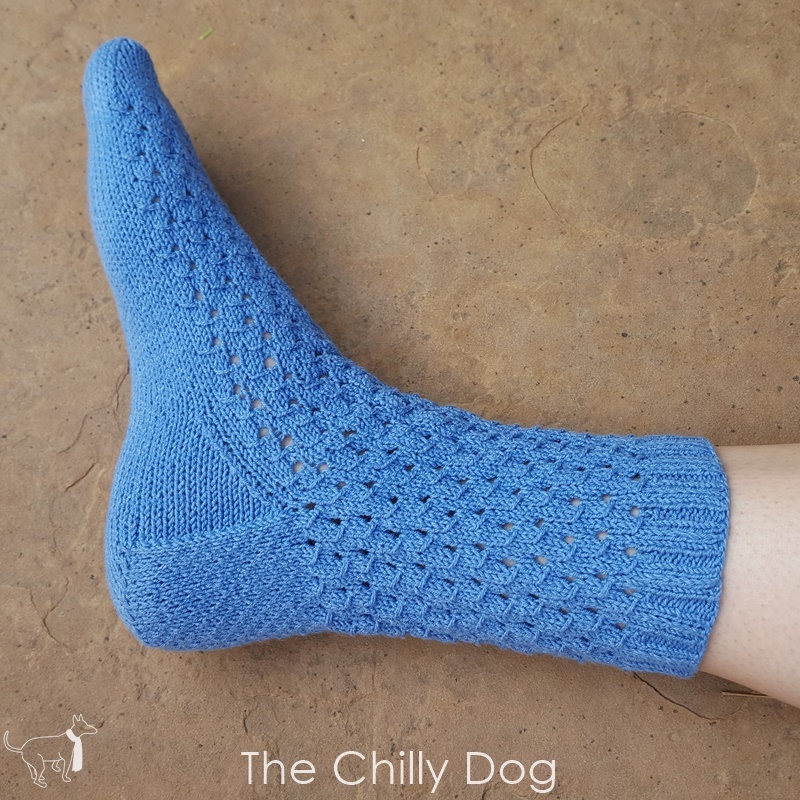 These pretty socks are worked from the leg down and have an Eye of Partridge heel flap, French turn heel and a rounded, star toe. Many thanks to Skacel for providing the CoBaSi by HiKoo yarn that I used in this pattern. I love this stuff for warm weather socks. This yarn is available locally at many yarn shops and online at Makers' Mercantile. 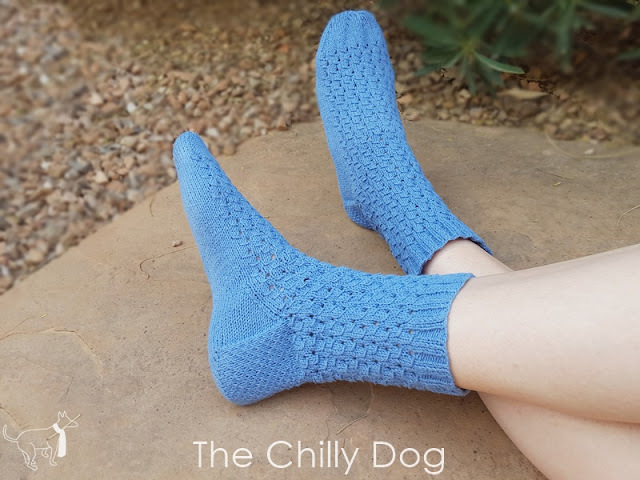 A printable version of the 'Like a Wink and a Smile Socks' pattern, with additional sizing options, is available for purchase in my pattern shop. Rnd 1: k1, [p1, k3] to last 3 sts, p1, k2. Rnd 2: k1, [ p1, k1, sl1, k1] to last 3 sts, p1, k1, sl1. Rnd 1-2: k all sts. Rnd 3: [k1, yo, sl1, k2, psso] repeat around or across specified number of sts. Rnd 4-6: k all sts. Rnd 7: [yo, sl1, k2, psso, k1] repeat around or across specified number of sts. Rnd 8: k all sts. Work Slipped 3 x 1 Ribbing for 1 inch. Work Slipped Eyelets until leg measures 5 inches from CO, ending after Rnd 4 or 8. The heel is worked using an Eye of Partridge heel flap and French turn heel, across half of the sock sts, 32 sts. After working Row 1 of the heel, it may be helpful to place instep sts onto a stitch holder or spare dpns. Row 1 (RS): [sl1, k1] 16 times. Row 2 (WS): sl1, p31. Row 3: sl2, [k1, sl1] 14 times, k2. Work Row 1-4 eight times. 32 rows. Row 1 (RS): sl1, k17, ssk, k1, turn. Row 2 (WS): sl1, p5, p2tog, p1, turn. Row 3: sl1, k to 1 st before the gap, ssk, k1, turn. Row 4: sl1, p to 1 st before the gap, p2tog, p1, turn. Repeat Row 3-4 until all of the heel sts have been worked and no gaps remain. Skip the last k1 and p1 in the final two rows of the turn heel. Row 5 (½ of a RS row): sl1, k8. The remainder of the sock is worked in rnds that start at the center of the heel. Return held instep sts to needles if necessary. Rnd 1: k9 across remaining turn heel sts, pu 16 sts along the side of the heel flap, it is helpful to place a marker here between the gusset and instep, continue Slipped Eyelet pattern across the 32 instep sts, it is helpful to place a marker here between the instep and gusset, pu 16 sts along the side of the heel flap, k9 to the end of the round. 82 sts. Rnd 2: k to 3 sts before the end of the gusset, k2tog, k1, work Slipped Eyelet pattern across the instep, k first gusset st, ssk, k to end of rnd. Rnd 3: k to the end of the gusset, work Slipped Eyelet pattern across the instep, k to the end of the rnd. Repeat Rnd 2-3 until 64 sts remain. All Rnds: k16, work Slipped Eyelet pattern across 32 instep sts, k16. Work the foot until the sock measures 7 ½ inches from the back of the heel 2 inches less than desired foot length ending after Rnd 4 or 8 of Slipped Eyelets pattern. K all sts for 2 rnds. [K6, k2tog] 8 times. 56 sts remain. K all sts for 2 rnds. [K5, k2tog] 8 times. 48 sts remain. K all sts for 2 rnds. [K4, k2tog] 8 times. 40 sts remain. K all sts for 2 rnds. [K3, k2tog] 8 times. 32 sts remain. K all sts for 2 rnds. [K2, k2tog] 8 times. 24 sts remain. K all sts for 2 rnds. [K1, k2tog] 8 times. 16 sts remain. K all sts for 2 rnds. [K2tog] 8 times. 8 sts remain. Break yarn leaving a 12 inch tail. Thread yarn onto yarn needle and pull through remaining 8 sts to close the toe. Don't forget to share pictures of your finished socks on social media with #thechillydog and tag me @thechillydog. 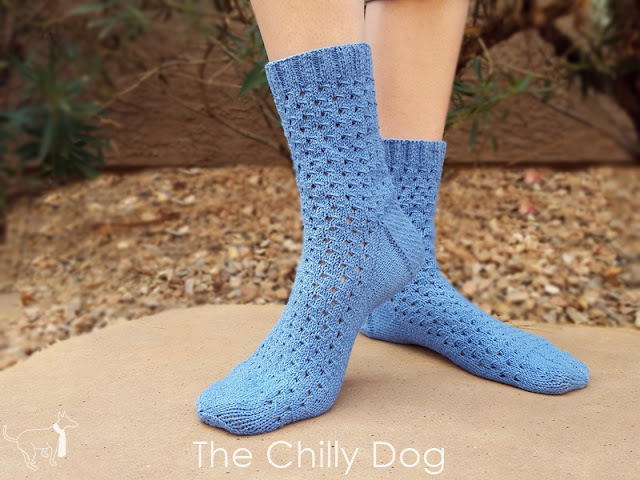 Free Knit Sock Pattern for spring: Wool free yarn and airy eyelets go together like a wink and a smile.